for an old veteran photographer at the salt it was a frustrated experience. Around the startingline....some of the not credential photographer understand our concern and walked back, only that five other walked into the press area. but also the credential photographer was sometimes a pain in the Acura.....they stand (for hours) on the same place, block the view or creates bad shades...when ask him to move a little bit they didn't listen and just stand still on the place...sometimes you have to be very polite... ...or you got the luck that a other photographer tells him more polite..."move your Dodge...."
At last I left the starting line and went out on the course...making low speed picture between 1 and 1 1/2 mile....in the beginning there was no chance to make proper parachute picture on course 1....the pit was so long that the parachute/racer disappeared in the pit....no way...the last day, when the pit start to empty I could pick the Speed Demon on his 451 mph run from the 5 1/2 at the center boulevard. THAT will scare them away...fastlike... Guarantied. LOL! Since there were a coupla folks shooting photos with iPads, I spose I coulda grabbed wonna those and smacked that geek with the striped shorts severely about the head and body. The president is from another century. Sorry Ray. My mistake; that comment was for PorkPie. No offence, but I'm quite sure his German is better than yours. I COMPLETELY misunderstood the post I was commenting on. I know enough German and body language to get the point. But yeah, PP speaks his native tongue much better than I do. The temper tantrum in the video was pretty funny. There are 4 sections: Quick Pix, The rest, Bad Manners and Rods & Kustoms. The section names are pretty self explanatory, although I'll mention that the Bad Manners section was prompted by the abysmal shooting etiquette (lack thereof) at the starting lines, especially in the wake of HotRod (Larry)'s post here about the aforementioned subject. Simply put, it was a whore's nightmare. I'm gonna continue the rant in that Larry's thread, but you can see some pretty good examples here. 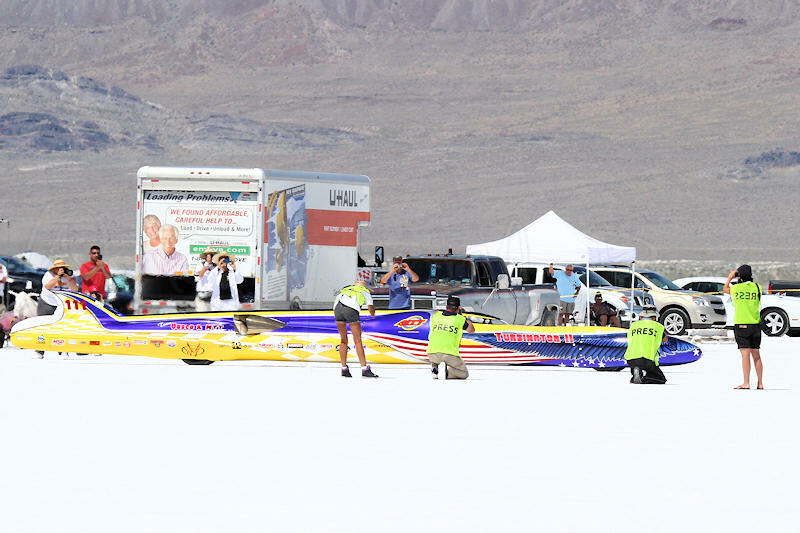 Cool, you got a shot of me at Bonneville! Seriously though, even if all of 'those' people weren't in the way, what do you want a photo with all that crap in the background for? I'm pretty sure this is one of the shots I took, and as you can see, I was quite a way back from the edge of the track. That long lens you're using is obviously compressing the image quite a bit and making it look like we're right on top of the car. What's just as annoying is the fluoro vests in the background of so many of the shots. I understand the need to be able to identify people quickly and easily, but do the people on the Moon need to see us as well? Maybe a more sympathetic, but still easily visible colour could be an option? This whole, "Put fluoro on and she'll be right, mate" safety thing has got out of hand. Of course, later on in the week it was much easier to get a nice clean shot. I thought this one was a cracker! So I am sorry if I am in your shot, but come on its a full week and I could also take pictures of photographers in the way, but what does it prove or change? Speed Week is the largest most exciting 'racing' event that almost any photographer worth his 'salt' is allowed to stand next to dangerous vehicles, be allowed to acess the pits with out giving up a first born. We get to meet and become friends with a great bunch of people, and did any of you actually 'miss' a shot that would have been carreer changing? Do some things need to be address? Yes show up to a SCTA Board meeting and express your views.